Parsley cannot be isolated just as a part of appetizing and aesthetic food presentation. More than just a culinary herb, Parsley leaves and its seeds are used throughout the world as a magnificent spice that kindle the taste and zest of the food to which it is added to. Scientifically known as Petroselinum sativum, Parsley is native to the eastern parts of the Mediterranean region. Parsley seed essential oil, just as the name suggests is extracted from the dried seeds of the Parsley plant through steam distillation method. Ayurveda has recorded the effects of Parsley herb and its essential oil as a powerful diuretic without leading to any drying out of the body. Parsley was traditionally used in making tea for treating gallstones and dysentery. Trusted as a powerful carminative, the leaves, seeds and roots of Parsley were used in treating numerous digestive problems including diarrhea, ulcer, flatulence and colic pain. The juice extracted from the roots of this plant was used in folklore medicine as a diuretic and for treating kidney disorders like nephrolithiasis (kidney stones). Parsley seeds are used as an important spice in the Asian countries and specifically there is no Indian kitchen without Parsley seeds as the seeds and its powder are used in all kinds of routine cooking. The essential oil extracted from Parsley seeds was used in massage for normalizing menstruation and as a natural abortifacient. This oil is said to be effective in treating amenorrhea and menstrual pain or dysmennorhea. Parsley herb is used for garnishing and adding extra flavor to all types of food items and is a major ingredient in tabbouleh, the national food of Lebanon. Crushed Parsley leaves have been used for topical application for insect bites, skin parasites and skin tumors. Other conventional uses of Parsley include its use for treating arthritis, anemia, cancer, prostate problems and liver disorders. The healing effects of Parsley seed essential oil are antiseptic, diuretic, anti-arthritic, anti-rheumatic, astringent, digestive, stomachic, tonic, carminative, emmenagogue, laxative, hypotensive, uterine, stimulant, febrifuge, detoxifying and antimicrobial. The major chemical constituents that contribute to its therapeutic values are limonene, myristicin, tetramethoxyally benzene, alpha-thujene, eugenol and certain flavonoids including apigenin, luteolin, appiin and crisoeriol. Ayurveda has gained great honor mainly due the fact that it appreciates individual differences and treats every individual with a specific therapy. This holistic approach trusts that no two human beings on earth are the same and so are their health conditions as well. With this faith, Ayurvedic treatment varies from person to person even if a group of people are affected by the same disease. Ayurveda identifies individuals based on their individual constitution that comprises three major energy elements known as doshas, namely vata, pitta and kapha. Dosha predominance is the deciding factor for determining your physical and mental attributes whereas imbalance of doshas leads to sickness. Parsley seed essential oil is known for reducing increase of vata and kapha doshas and increasing pitta deficit, for which it is known as an excellent digestive aid. Since the prehistoric period, Parsley is known as a diuretic and detoxifier that aids in eliminating dangerous toxins from the body through urine. The depurative property of this oil purifies the blood and promotes the trouble-free flow of oxygen to all the tissues in the body. Gently massaging your body with 2 drops of Parsley oil blended with coconut oil aids in promoting blood circulation and helps expel the unwanted substances from the body without any side effects. You can also add 2 to 3 drops of Parsley seed oil in your warm bathing water for treating fluid retention, urinary problems, kidney disorders and certain other problems like rheumatism. Parsley seed oil as a natural diuretic increases the frequency of urination without making you tired or dehydrated. This aids in the removal of harmful toxins like salt, uric acid, fat deposits and microbes in the body, when left unnoticed can cause renal calculi, arthritis, skin diseases and may affect the overall functioning of the body. Parsley in general is claimed as an effective chemoprotective food that guards the body from harmful free radicals that lead to dangerous diseases like cancer, atherosclerosis, asthma and diabetes. Parsley seed essential oil and the herb is a rich source of antioxidant nutrients like luteolin and other flavonoids have been proved to function as antioxidants that join with highly reactive oxygen radicals and aid in preventing oxygen-based damage to cells. A study on ‘Cancer Prevention’ by Salman Hyder from the University of Missouri proved that the presence of apigenin compound in parsley and celery helps fight the growth of cancerous tumor in breast by blocking the formation of new blood vessel in tumors. Myristicin compound in Parsley oil has also been proven to restrain the growth of tumors especially in lungs. This oil has emmenagogue properties that stimulate blocked menstruation and regularize the menstrual cycle. Massaging your abdomen with 2 drops of Parsley oil mixed with sesame oil helps in treating various problems associated with menstruation like abdominal cramps, fatigue, nausea, headache and back pain. Parsley seed oil also promotes the secretion of estrogen, the female hormones and nurtures the health of female reproductive organs. The major causes behind rheumatism and arthritis are fluid retention, obstructed blood circulation and amassing of uric acid in the joints and muscles. The detoxifier, depurative, stimulant and diuretic properties of this oil removes toxins like salts and uric acid from the joints and muscles, expels water retention, helps get rid of impurities in the blood and promotes blood circulation. The Ayurveda and Aromatherapy book by Bryan Miller and Light Miller quotes “Parsley is excellent for the circulation and is known to eliminate broken capillaries in combination with Rose oil and cold compresses.” Parsley seed oil also has anti-inflammatory properties that aids in reducing rheumatic pain and inflammation. A warm massage with 3 drops of Parsley seed essential oil blended with sesame oil helps in reducing pain, inflammation and promotes frequent urination without loss of energy through which the harmful toxins in the body are eliminated. You can also use few drops of Parsley oil either in warm compress or in warm bathing water for complete relief from rheumatism, gout and arthritis. As a laxative with carminative and stomachic properties, using Parsley seed essential oil in massage or in bath tub aids in enhancing the secretion of bile and certain other gastric juices along with digestive enzymes. This assists in stimulating regular bowel movements, treat constipation, flatulence, stomach infection, ulcer and pain. 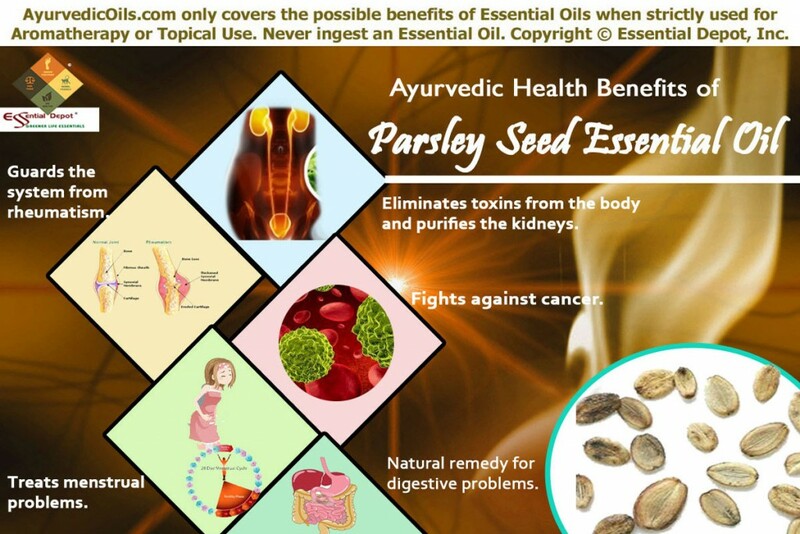 Apart from these major health benefits, Parsley seed essential oil is also used for various other health problems like cough, high blood pressure, hypertension, colic, gastrointestinal disorders, wounds, swollen breasts, prostate conditions, jaundice, gall stones, cellulite, cystitis, sciatica, loss of libido, hemorrhoids and gum problems. 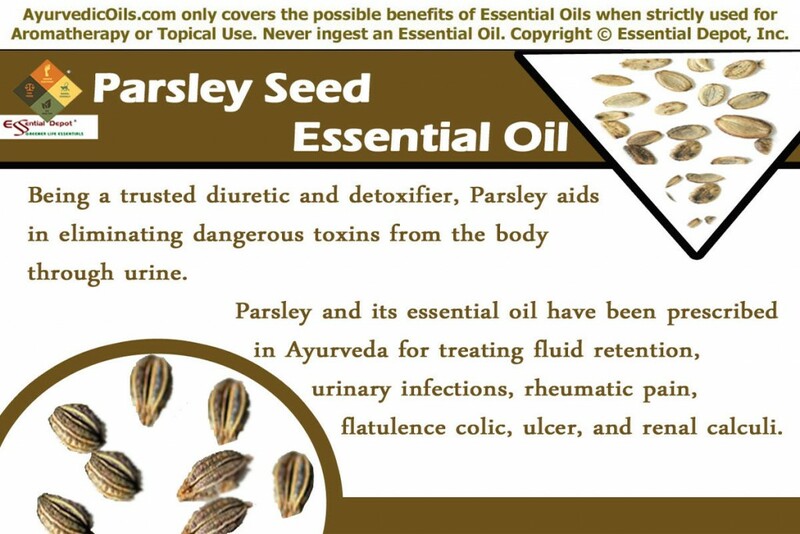 This entry was posted in Essential Oils - Learn About and Purchase and tagged Ayurveda and Parsley, Ayurvedic health benefits of Parsley seed essential oil, Ayurvedic oils for cancer, Ayurvedic oils for mentrual problems, Ayurvedic oils for rheumatism, Ayurvedic remedies for kidney stones, Chemical components of Parsley Seed Oil, Dysmennorhea, Health benefits of Parsely seed essential oil, Natural remedies for digestive problems, Nephrolithias, Parsley essential oil, Parsley oil, Petroselinum sativum, Therapeutic properties of Parsley Seed Oil by AyurvedicOils. Bookmark the permalink.